Bio: David Marcarian, MA, founder of Precision Biometrics, and inventor of the revolutionary MyoVision 3G Wirefree PhysioMonitoring™ System is a former NASA researcher. In 1986, Marcarian was awarded a $450,000.00 NIH grant from the National Institutes of Health (NIH) to develop an electrophysiological computer-based device for measuring muscle activity, skin temperature and skin resistance. In 1989, David founded Precision Biometrics, Inc. for the purpose of providing health care professionals and researchers alike with Surface EMG equipment for electrophysiological measurements. Precision Biometrics is known for providing a rugged, highly reproducible Surface EMG system with the easiest to use software available. Mr. Marcarian is one of the world’s foremost authorities on electrophysiological computer-based devices. Marcarian won one of the largest PI awards in US history, and established the validity of sEMG in a major State Superior Court Decision. Recently, Dr. John Gerhardt, author of the AMA publication: "The Practical Guide to Range of Motion Assessment" endorsed the MyoVision 3G product. Marcarian now trains doctors worldwide through his comprehensive training course: "MyoVision Team Elite." 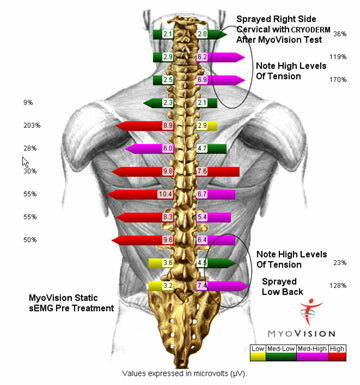 The MyoVision Static Surface EMG system (Model 3G) was used to test a patient complaining of muscle tension and pain in the right cervical region C2 to C7 and right lower lumbar. MyoVision is the optimal tool for testing, as it is very sensitive, performs the test in a standing neutral position (weight bearing tests are more demonstrative (as in X-Ray), and is the premier tool for SEMG testing since 1989. Reading the MyoVision graphs below are simple. The device is similar to an EKG in that it measures a summation of the motor unit firing (or depolarizations) beneath the skin where the electrodes are placed. Electrodes are touched down momentarily on the skin at C2, C4, C6 and at every other level of the spine down to L5. The bars shown are proportional to muscle activity: The higher the muscle activity, the further the bars protrude from the spine. Readings are in microvolts (millionths of a volt). The patient was tested in a standing position. After the initial test the cervical and lower lumbar spine were treated unilaterally with CRYODERM™ in the areas that showed higher muscle activity, indicating hyper tonicity. 2. 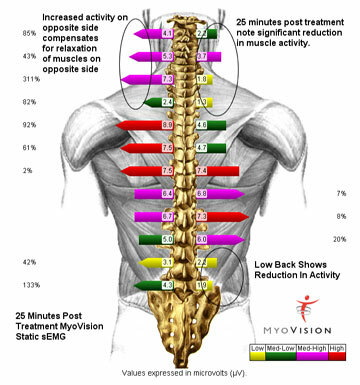 Muscle tension increased on the opposite side in both the cervical and lumbar spine, which is a common response that we see when the opposite side experiences dramatic release. The muscles on the opposing side contract to compensate for the release. Based on clinical experience it is common to see this compensation pattern subside, and a balancing to occur within a few hours. Additionally, treating the area bilaterally should eliminate or greatly reduce this affect. After careful evaluation and under controlled circumstances using the MyoVision SEMG System it was determined that treating painful, swollen, hypertonic areas with CRYODERM™ showed significant reduction in muscle activity, thereby aiding in the release of hyper tonic muscles and a breaking of the pain spasm cycle. Since our initial testing I have spoken with several Doctors who have found the same results. Additionally many of these Doctors use CRYODERM™ pre adjustment to dull the proprioceptors in order to lessen the response from muscle spindle cells, during and post adjustment (mimicking MUA--manipulation under anesthesia). Doctors are finding that the utilization of the MyoVision in conjunction with CRYODERM™ and Chiropractic adjustments provides more effective, longer lasting results that can be visually seen by the patient. Using MyoVision assists the Doctor to more accurately apply CRYODERM™ and helps in tracking the effectiveness of treatment with regards to the utilization of CRYODERM™ and adjustments. It is therefore my opinion that CRYODERM™ is an extremely effective drug and an excellent adjunct to Chiropractic and other physical modalities.